Print / File Electronically 1099 DIV & Other 1099 Forms. Prints on 1099 Dividend laser forms and on blank paper. Supports 1099-DIV, MISC, INT, R, S, 1098-T, 1098, 1099 A, 1099 B, 1099 C, 1099 PATR and 1099 OID Forms. Trusted by thousands. Buy Now & Receive Instantly ! Automatically calculates totals for 1096 and W3. Exports IRS 1099 DIV forms & W2 /1099 forms to Excel. Unlimited W2, 1099 & 1099 DIV recipients / payers. Meets Internal Revenue Service & SSA regulations. Download - risk free trial. Click "Download FREE Trial"
Available for 2018 (2019 season), 2017 & before. Password protection PLUS W2 1099 data validation. Create 1099-DIV, MISC, INT, R & W2 in minutes. 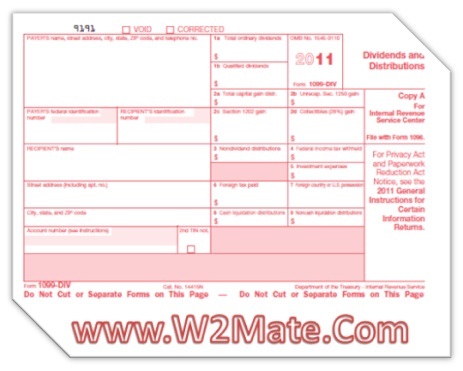 W2 Mate is a powerful W2 / 1099 software that supports a number of 1099 forms other than 1099-DIV. 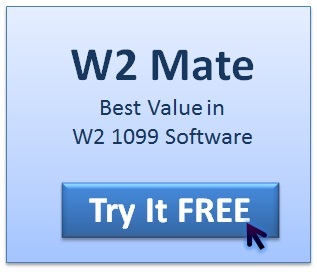 This page is dedicated to 1099-DIV, to read about the full capabilities of W2 Mate click here . Start printing now...Order our 1099-DIV IRS Software and receive instantly! 1099-DIV Copy B (1099 Dividends Copy B): For Recipient. 1099-DIV Copy C (1099 Dividends Copy C): For Payer. All these form 1099-DIV copies can be printed on blank paper with black ink. Laser Copy A of form 1099 DIV (1099 Dividends Laser): For Internal Revenue Service Center. 1099-DIV recipients, unlike other W2 and 1099 Dividend systems! Exports 1099DIV data to Excel format. Helps filers meet IRS 1099 Dividend reporting requirements. Upon entry of basic 10 99 DIV recipient information, the program automatically populates 1099-DIV form, with data-entry screens using form replicas. Our 1099 system (along with any optional feature code(s)) can be delivered by email for instant access or shipped on a CD (compact disc). please visit our IRS 1099 software page. Use 1099 Dividend Software to enter dividends, including dividends from money market funds, net short-term capital gains from mutual funds, and other distributions on stock. Include reinvested dividends and section 404(k) dividends paid directly from the corporation. Include as a dividend the amount of the recipient's share of investment expenses that you report in box 5. Enter the portion of the dividends in box 1a that qualify for the zero and 15% capital gains rates. Box 2a: Total Capital Gain Distr. Enter total capital gain distributions (long-term). Include all amounts shown in boxes 2b, 2c, and 2d. Enter any amount included in box 2a (if you already filled out this box inside 1099 DIV printing software) that is an un-recaptured section 1250 gain from certain depreciable real property. Enter any amount included in box 2a that is a section 1202 gain from certain qualified small business stock. Enter any amount included in box 2a that is a 28% rate gain from sales or exchanges of collectibles. Enter non-dividend distributions, if determinable. File Form 5452, Corporate Report of Non-dividend Distributions, if you are a corporation and paid non-dividend distributions to shareholders. Enter the recipient's pro rata share of certain amounts deductible by a non-publicly offered RIC in computing its taxable income. This amount is includible in the recipient's gross income under section 67(c) and must also be included in box 1a. Do not include any investment expenses in box 1b. Enter foreign tax withheld and paid on dividends and other distributions on stock. A RIC must report only the amount it elects to pass through to the recipient. Report this amount in U.S. dollars. Enter the name of the foreign country or U.S. possession to which the withheld tax applies. Box 8: Cash Liquidation Distr. Enter cash distributed as part of liquidation. Box 9: Noncash Liquidation Distr. Enter noncash distributions made as part of liquidation. Show the fair market value as of the date of distribution. 1099 Tax DIV Form Who Gets What Copy? Our 1099-DIV software is designed for use by businesses and tax professionals; this is not a 1040 software or 1040ez program .Please visit the IRS website if you are looking for 1040 instructions. Ready to print and E-file 1099 IRS DIV forms? Download a free demo of our 1099 DIV software now , enter actual recipients and see for yourself how easy and powerful this software is (make 1099 DIV in minutes). Although Intuit QuickBooks only supports 1099-MISC forms, our 1099-DIV software allows QuickBooks users import 1099 data and then map it into 1099-DIV forms with the ability to specify which box the money amount goes to. For example the user can remap QuickBooks 1099-MISC amounts stored under 1099-MISC Box 7 (Nonemployee compensation) into 1099-DIV Box 1a Total ordinary dividends. 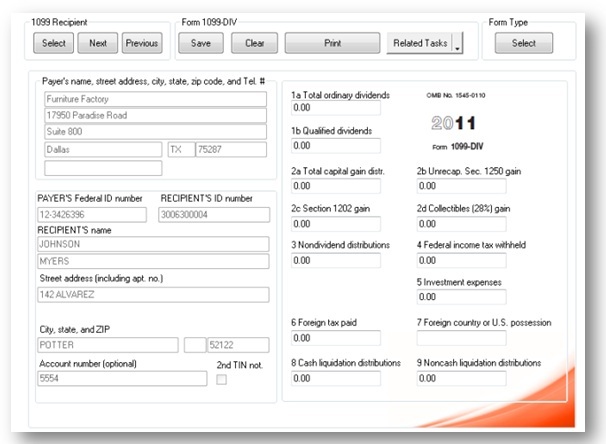 Once the QuickBooks data is imported as 1099-DIV data inside our software, the user can modify it, print it to laser 1099 DIV forms, print it on regular white paper or electronically file QuickBooks 1099-DIV with the IRS. How to print forms DIV 1099 using our software. 1- Install W2 Mate software. If you haven't bought our Form DIV 1099 Software, then you can start by downloading a FREE demo here. 2- Start W2 Mate software. 3- Click on Company icon from the left toolbar and fill out your company information. Please make sure to fill out the fields under 1096 information tab. 4- Click on the 1099 & 1098 Recipients icon from the left toolbar. 5- Add your 1099 DIV recipients one by one (you don't need this step if you imported your 1099DIV data from file or from an accounting software such as QuickBooks). 6- Click on 1099 & 1098 Forms tab from the left toolbar. Under Form Type, click Select and then pick Form 1099-DIV from the list. 7- Now you should be inside the 1099-DIV screen. 8- Go through the 1099 Dividend recipients one by one and enter the money amounts. For example fill out Box 1a Total ordinary dividends. Please remember to save data before you move from one recipient to another. 9- Now to print data click on the Print button. This will bring up the Print 1099 DIV forms dialog. Select the recipients you want to print and the type of copy. You can print all copies on regular white paper except for "Dividends and Distributions Copy A For Internal Revenue Service Center", you need to print it on pre-printed forms. 10- If you are printing on pre-printed 1099 forms DIV then you can adjust the offset(s) until you get a perfect copy.